For safer, easier transportation of 205L oil drums. Handle included. 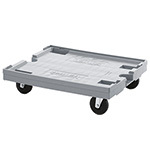 Link these dollies together to create your ideal platform size. 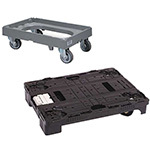 Plastic dolly with four castors, holds up to 250kg total capacity. Constructed from injected moulded, lightweight and hygienic plastic. 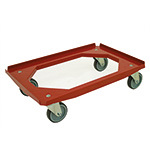 If you're looking for help in moving and handling heavy and bulky items such as furniture, our dollies will help. Plastic dollies are a great solution if you need something lightweight and easy to store when not in use. 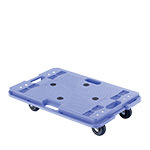 Many tray dollies in our range of plastic dollies can be connected to create a large surface, perfect for moving large items. Plastic dollies have the added benefit of being easy to clean. 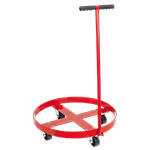 Each plastic dolly is designed with swivel castors to ensure they are as easy to move as possible. Several of our plastic dollies are constructed to allow them to stack, nest and save space in your workshop or warehouse. The bespoke piano moving platform dolly is an invaluable tool when you need to relocate your prized possessions safely. 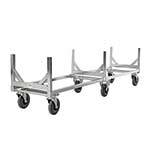 Choosing the right dolly for the job will reduce the risk of damage to the item and to the person using the trolley. 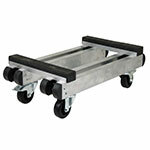 Heavy duty dollies boast sizeable load capacities, with the aluminium piano dolly coming in at 500kg. If you're looking for a transport trolley capable of handling long loads a long load trailer would be an excellent choice. Use it to move heavy pipes such as scaffolding or lengths of timber. A selection of our dollies are designed for use with plastic stacking boxes. Plastic stacking boxes can be difficult to get your arms around, especially when full. These dollies feature a lip to avoid boxes slipping off. Thanks to the lip you can happily use them for handling stacks of boxes. So, when you're moving house be sure you have a furniture moving dolly to hand. 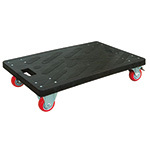 Professional removal companies and furniture movers will own a selection of handling equipment including dollies, sack trucks and even pallet trucks. 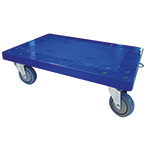 Pallet trucks are generally used for moving wooden or plastic pallets and best reserved for expert use. Our dollies as such, are not manufactured from food grade plastic, but they are hygienic and really easy to clean. 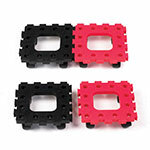 They can be used with food grade plastic containers. This is where dollies with the surrounding lip are the best choice. 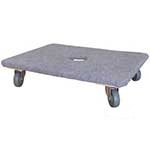 If you're moving delicate or fragile items a dolly with a padded top can be a wise move. The padded surface will provide protection against scratches, reduce slippage and help to absorb impact over bumpy surfaces. 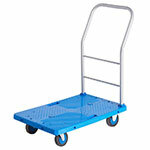 Another bespoke handling solution that is part of our range of heavier-duty dollies is the drum dolly. Specifically suited for moving 205 litre oil drums. The handle reduces the need for pushing on the drum to move it. 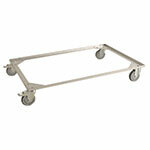 Simply pull the drum dolly along on the handy castors. 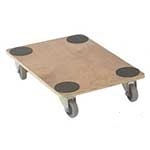 Swivel castors spin 360 degrees making their platform really easy to move in tight spaces. 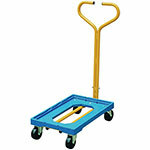 When using your dolly in an area where it's important to keep the peace, places such as libraries or hospitals, we can supply dollies with extra-smooth silent castors, for a quieter ride. Dollies are sometimes known as moving skates, probably because they are a little similar to skateboards, but without the baggy trousers.